A few months ago, a fellow blogger, Nava, approached me and asked whether I'd be interested in contributing an article on pregnancy in her lifestyle blog, Nava-K. Unfortunately, I somehow accidentally deleted her comment in my blog about this invitation and could not retrieve the deleted comment ever again! It looks like once you delete a comment in your blog, there is no 'undo' button to bring it back to your blog's comment page. In short, I only managed to reconnect with Nava again via email last week to further discuss about this potential collaboration. After some email exchanges, I agreed to contribute an article from my blog to Nava's blog. She suggested that I send her my article on preventing stretch marks during pregnancy to be posted in her blog. I said, "No problem.". Without further ado, please check out my first guest post in Nava's blog here. By the way, don't forget to follow Nava's blog too. 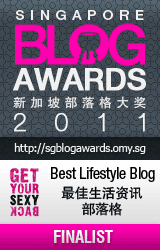 Her blog contains updates on fashion, beauty, travel, health issues, food and many more interesting topics to read. Thank you again, Nava, for the opportunity in contributing a guest post in your esteemed blog!